Sweden is Finally in the World Cup; Now What Are Their Chances Of Advancing? Monday is the day that all the Swedes have been waiting for, as they will take on South Korea in Group F in their first World Cup match in 12 years. It has been a long time coming for Sweden, which experienced two heartbreaking qualifying campaigns followed up by a near disaster at the Euro 2016 Qualifiers. That led to low expectations during this year’s Qualifiers. However, Sweden surprised everyone by going 6-3-1 in a group consisting of the likes of France and the Netherlands. Yes, they got their fair share of breaks along the way, but they also did an excellent job to set themselves up for those breaks. While they lack a superstar player that an everyday soccer fan knows, they make up for it by being super organized. This is a team that won’t run up the score on teams like Moldova, but at the same time, won’t be beaten 5-0 to countries that are superior to them. It seemed like it would take ages for Sweden to reach the World Cup again. But the truth of the matter is, they’re dealt with a small population every cycle. It’s harder to compete against the bigger countries, yet up to this point, they have. With the new draw procedures in place for the 2018 World Cup, Sweden is placed in Pot 3, joining Germany, Mexico, and already mentioned South Korea. If they don’t win the first game of the group, they might not make it to the knockout stage. Mexico is stronger than most people give them credit for. They held Brazil to a 0-0 tie and beat Croatia in 2014, and followed that up knocking off defending World Cup champion Germany, 1-0, in their first match of this year’s World Cup. Sweden should realistically tie against South Korea and Mexico before falling to Germany. Sweden will likely not get the fortunate bounces they did in Qualifying that brought them here, though there is a chance they can advance to the Round of 16 with three ties, but that’s rare. The first game will go a long way into telling the strength of Sweden. 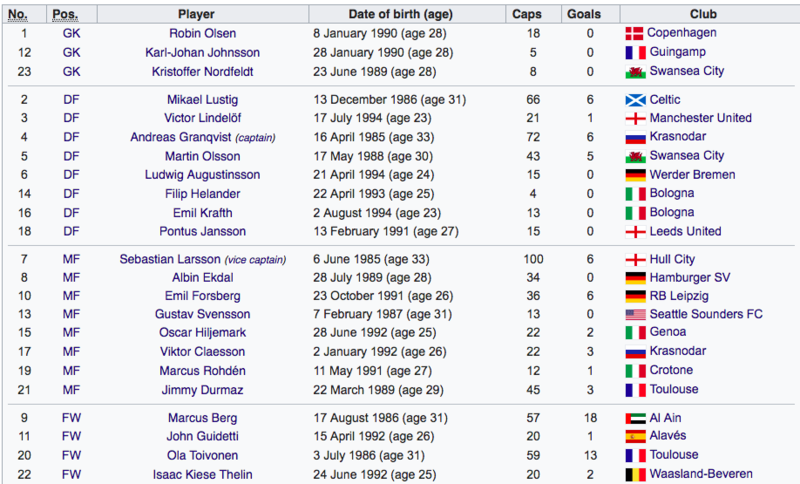 One of the problems they have is that there is no one on this roster Sweden fans should feel comfortable with getting a goal if this team needs one. In order to advance, they need to be defensive minded all tournament long.